Here’s another Bislish (Bisaya-English) blog entry from one of our alumni living in the town proper as he narrated his childhood story about the historical landmark in our town—Rizal Park. Unlike other town plazas and parks, ours is a miniscule and precarious one. Not because it shares proximity to the highway but the area is too small that it only accommodates the statue of our national hero, the spherical fountain at the middle, with range of foliage embellishing the surroundings and tiny bermuda area as playground for children. Nevertheless it provides good avenues for children to gain access to real recreation and fun sports. The fun sports I mean were climbing the statue of Rizzy (Dr. Jose Rizal) using nothing but bare hands (it’s already an Everest during my time), sliding with a pair of slippers at the hedge of the park and playing hide-and-seek with the rest of the barkadas. Though you need to be extra careful while playing, as a little recklessness will be worth the experience you would surely remember for the rest of your life. Unsaon man gud nga sa akong pagkabata, dili jud nako ikalimod ang akong kakiat. Saksi si Rizzy, sa akong mga gipanulti. Bahala’g lisod katkaton ang monyumento ni Rizzy pugson gihapon ug saka. Si Rizzy usab ang pwede maka-explain sa mga uwat sa akong kilay, suwang, bukton ug mga tuhod. Maong hangtod karon, bisan unsaon nako’g pahid ug ointment dili na gayod mapapas. 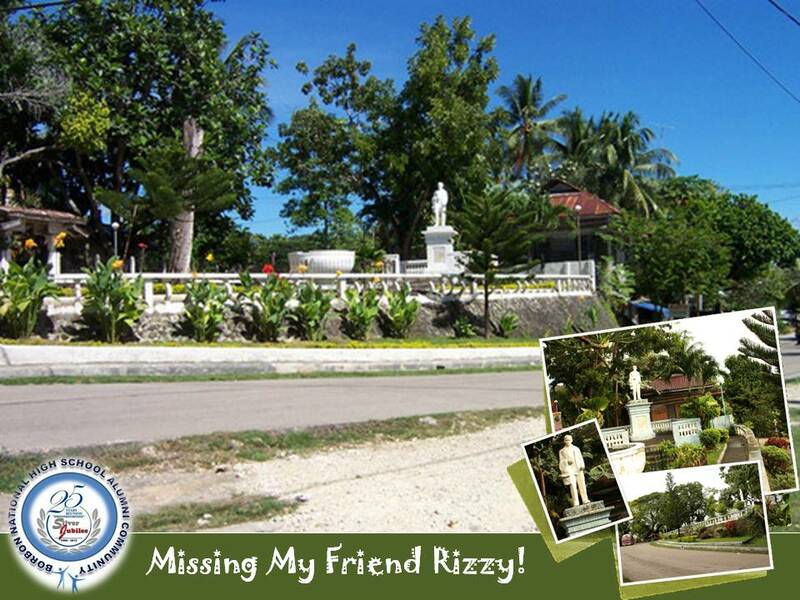 Though my friends and I used to have plenty of sweet childhood memories at Rizal Park. Sa park mi pwede mag dakop-dakop, tago-tago, layat-layat, ambak-ambak and all kinds of fun activities we can think of. Usahay kong dili magkasinabot, apil na gani ang away-away. Ang ending, sumbong-sumbong dayon sa mga ginikanan. Maayo na lang gani kay dili moapil ang mga dagko sa among away kay kabalo man sila nga puro ra jud to binata amoa. Although the place is not suitable for small children, it somehow provides the best chance for us to play, run, perform plenty of tricks without limits. Siguro tungod kay walay laing outlets ang mga kabataan (sa among lugar) kaniadto maong sa Rizal Park na lang modalikyat ug duwa. Wala pa man gud mauso sa una ang computers, internet, cellphones, tablets, laptops ug uban pa.
Then I realized how lucky we are to have had enjoyed our childhood with genuine leisure activities. It didn’t make us lazy and sedentary at all, but more of making our physical side in constant activity. Children before were not savoir-faire with technology. They even have limited access to television and techno stuffs. Kong naa gani tv ug betamax, sa silingan ra namong arangan… kong motan-aw ka, naa pa jud bayad…hehehe. The emergence of new technology nowadays brought several challenges to our children. This time, children are more inclined to staying indoor and play with PSP’s or gameboy, browsing the internet, going gaga with facebook and other social networking site, etc. than to venture outdoor like the park or plaza with their peers. Hahaay! Nakalimtan na gyud intawon si Rizzy sa mga kabataan sa Borbon. Nagpabiling ga-inusara ug barog sa iyang monyumento, nagpaabot nga bisitahon ug balik sa mga batang sip-unon kaniadto nga nalingaw ug duwa diha sa iyang nataran. Hold on Rizzy for we will meet again soon.